Best Dog Training in Boulder! How many times have you told your dog that you wish he/she could speak English? What if you could speak dog? With the Boulder Bark Busters Home Dog Training method, you can! 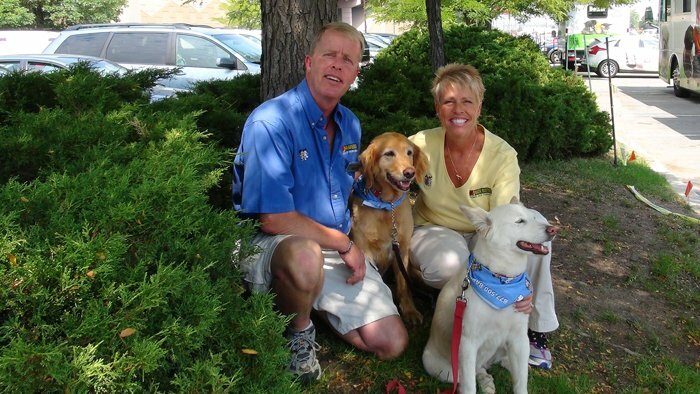 As a Boulder dog trainer for more than 5 years, we have successfully trained hundreds of dogs throughout the Boulder County area including Eldorado Springs, Erie, Hygiene, Jamestown, Lafayette, Longmont, Louisville, Lyons, Nederland, Niwot, Pinecliffe, Ward. How do we know we can be successful with your dog? We will teach you how to communicate with your dog in a language he understands. You will learn how to use your body language and vocal communication to get your dog to focus on you and respond to your directions. Our Boulder dog training method is a positive, non-physical (no choke, pinch, prong or shock collars) natural approach (no clickers) to dog behavior modification based on understanding and clear communication. We will come into your home for private dog training lessons. Your home is the most comfortable place for your dog and often where most of the bad behaviors occur. Free of unusual distractions, your dog will quickly learn to follow your house rules when it comes to housebreaking, barking, and leash pulling! Then we'll go outside and I'll help you safely and positively achieve socialization with other dogs and people in public settings avoiding or reversing aggression, fear and low confidence. We will help you train any dog, any age, any breed. With just 2 - 3 hours for the initial training session and 15 minutes of daily practice on your part, you can improve your relationship with your dog for life... guaranteed! Our Life-Of-The-Dog Guaranteegoes wherever you and your dog go! Bark Busters is the only company with National Support & Unlimited Training.This guaranteeis automatically transferred. It stays with your dog even if you move. So if you ever need a "tune up", just whistle and we'll come tails a waggin'. When we were first introduced to Bark Busters in 2004 with our newly adopted girls, Aspen and Indiana, we knew it was for us. Our greatest joy is being with our dogs. The thrill of being a Boulder dog trainer comes from helping others experience the same joy with their dogs. We are highly supportive of the Boulder animal shelters and rescue centers - no dog should be without a forever home. We look forward to sharing our expertise and enthusiasm with you. Give us a call to share and discuss your concerns about your best friend - your dog! Any dog. Any age. Any problem. No worries, mate! Please visit our local Dog Training Boulder website or Denver dog training website at www.dogtrainingdenvercolorado.com.